What should we call this? Hitchitti? 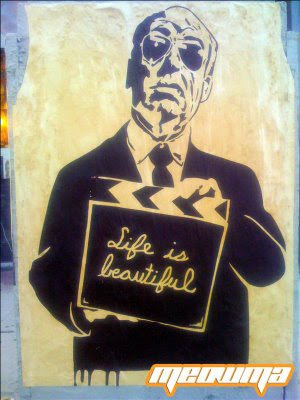 Blogger, musician and street art aficionado Meowma discovered this very cool graffito in Hollywood's Melrose District. Nice work. Given Hitch's preference for black suits as a sign of his alignment with the rather sinister Lew Wasserman (the sartorial choice being the old boy network's version of a gang sign), it isn't hard to imagine that the director saw himself in a somewhat gangsterly light. At least that's how I, and apparently this anonymous street artist may envision the Master of the Macabre. A pity he never made one if his cameo appearances in graffiti form -- the closest being the neon sign in ROPE and the slimming ad in LIFEBOAT. just found your site. Excellent!! Hitch is one of my favorites. I recently started my own Hitchcock blog, certainly not as extensive as yours. Here's the link. Here's also a link to my main blog. I have added your site to my blogroll.